1 1,600 Students at U of I Support Lettuce Boycott Larry Ekholt (D.M. Register EDITOR'S NOTE: THE FOLLOWING ARTICLE APPEARED IN THE FRIDAY OCTOBER 13 ISSUE OF THE DES MOINES REGISTER. IOWA CITY, IA. -- More than 1600 University of Iowa students and several U of I organizations have pledged not to buy lettuce in support of the United Farm Workers Union (UFW), the chairman of the UFW Student Support Committee said here Thursday. Antonio Zavala, A U of I student from Chicago, Ill., said the local support committee is concentrating of obtaining support from the more than 20,000 U of I students before it meets with university officials to ask that U of I quit serving lettuce in dining facilities here. 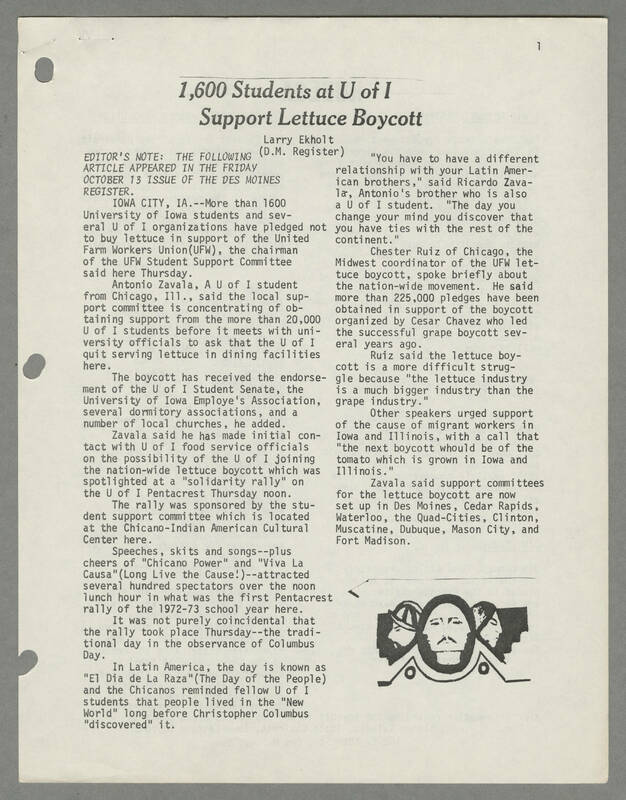 The boycott has received the endorsement of the U of I Student Senate, the University of Iowa Employe's Association, several dormitory associations, and a number of local churches, he added. Zavala said he has made initial contact with u of I food service officials on the possibility of the U of I joining the nation-wide lettuce boycott which was spotlighted at a "solidarity rally" on the U of I Pentacrest Thursday noon. The rally was sponsored by the student support committee which is located at the Chicano-Indian American Cultural Center here. Speeches, skits and songs -- plus cheers of "Chicano Power" and "Viva la Causa" (Long Live the Cause!) -- attracted several hundred spectators over the noon lunch hour in what was the first Pentacrest rally of the 1972-73 school year here. It was not purely coincidental that the rally took place Thursday -- the traditional day in the observance of Columbus Day. In Latin America, the day is know as "El Dia de La Raza" (The Day of the People) and the Chicanos reminded fellow U of I students that people lived in the "New World" long before Christopher Columbus "discovered" it. "You have to have a different relationship with your Latin American brothers," said Ricardo Zavala, Antonio's brother who is also a U of I student. "The day you change your mind you discover that you have ties with the rest of the continent." Chester Ruiz of Chicago, the Midwest coordinator of the UFW lettuce boycott, spoke briefly about the nation-wide movement. He said more than 225,000 pledges have been obtained in support of the boycott organized by Cesar Chavez who led the successful grape boycott several years ago. Ruiz said the lettuce boycott is a more difficult struggle because "the lettuce industry is a much bigger industry than the grape industry." Other speakers urged support of the cause of migrant workers in Iowa and Illinois, with a call that "the next boycott would be of the tomato which is grown in Iowa and Illinois." Zavala said support committees for the lettuce boycott are now set up in Des Moines, Cedar Rapids, Waterloo, the Quad-Cities, Clinton, Muscatine, Dubuque, Mason City, and Fort Madison.